Hello there, I’m Cathryn Dunsbergen. 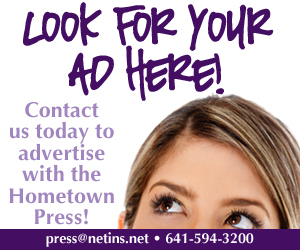 I am so excited to be part of the Hometown Press Team! I’m looking forward to sharing recipes, tips to make your house a home, personal stories, and more! You may be thinking, why Thelma & Bonnie’s? Well friends, Thelma was my great-grandma and Bonnie is my grandma. To find the whole story, head on over to my website thelmaandbonnies.com. In short, my great-grandma and grandma had/have this way of making anyone and everyone feel welcome in their home, and I wanted to put that feeling into words. 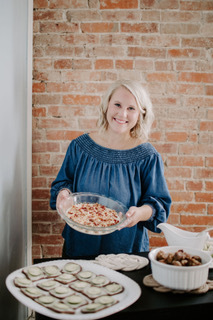 Thelma & Bonnie’s is here to share the feeling of being “at home” with recipes, hosting tips, spreading joy in dark situations, giving a sense of peace, and sharing laughter. I know everyone reading might not know me, so here are five facts. 1. Blake and I moved to Sully last March after we bought our first house. I grew up in the country, 15 minutes north of Pella, for the majority of my life. When we bought a house in town, I had some reservations, but I grew to love it! I love walking to the post office, having a gas station five minutes away, and having a small lawn to push mow! 2. Every birthday I blow out candles on my cherry cranberry pie. Cake isn’t necessarily my favorite, but when I am feeling cake, a chocolate bundt cake with powdered sugar hits the spot every time. 3. Truth be told, I have repainted our whole house twice. I couldn’t find the right color, but when I did it felt like I was walking into a big hug every time I turned on my kitchen lights. Blake and I are still in the middle of house renovations, but I will tell you nothing is as satisfying as doing projects yourself. It has also taught us a lot of patience. I cannot wait to share with you what we’ve done and where we are headed! 4. I love to play all games! The two that I am currently obsessed with are Catan and Battleship. I want to let you know that while I am writing this I am currently the Battleship champion in the Dunsbergen household, but Blake still stands as the defending champion of Catan. I’m still working on my strategy; do I buy development cards, build a long road, or do I surround myself with all of the resources? I still have no idea! 5. I love to cook and bake. My love for being in the kitchen started when I would make tuna sandwiches with my mom and guacamole with my grandpa. As I grew older, cooking and baking in the kitchen became a passion! I love grocery shopping, I love the grocery lists, I love the way my whole house smells after making a dish, and I love the way food brings people together. Now that you know a little more about me, I would like to share two recipes with you! These recipes are constant go-to’s in our house and can also be found on my blog. Grandma Bonnie’s Spaghetti is a dish that sums up my childhood; it was something my brother and sisters constantly asked for. 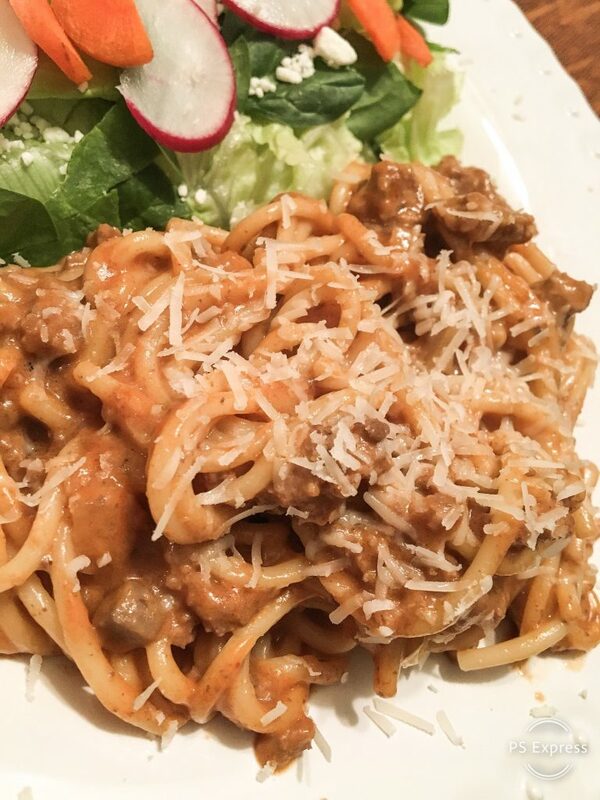 This delicious recipe warms the soul on cold winter nights without breaking the bank. 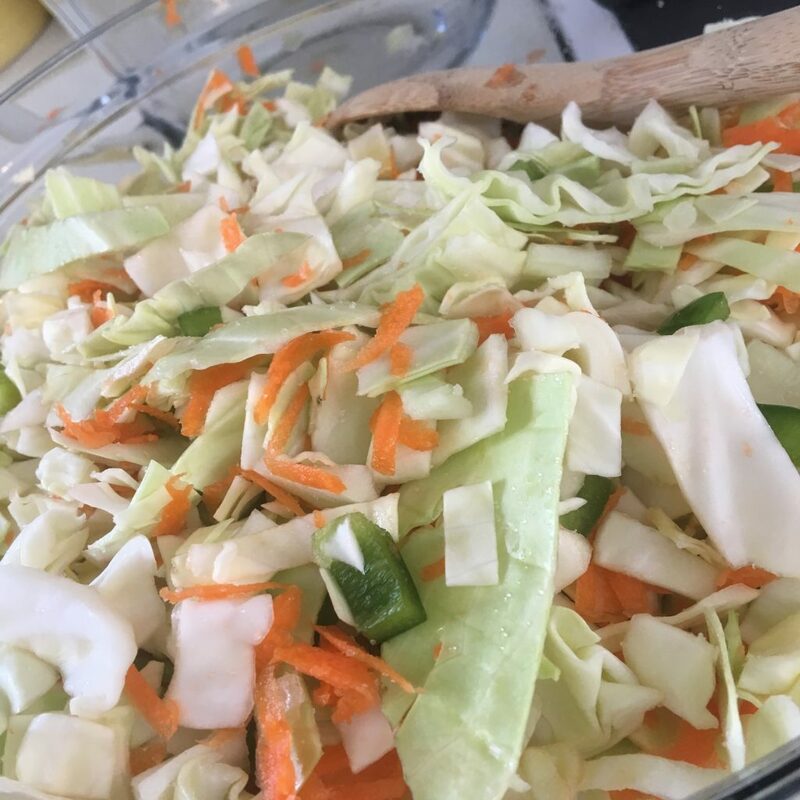 The second recipe is Grandma Bonnie’s Coleslaw. If you are a fan of homemade pickles, cabbage, vinegar, or relish trays – you will love this dish! Matter of fact, it is also a great side to Grandma Bonnie’s Spaghetti! Boom. There is dinner one night. I hope you enjoyed this read and enjoy these recipes! See you in May when there is a fifth Thursday again! Until then, if you want to receive more posts like this one, “Join the Thelma & Bonnie’s Family” by subscribing to my email list at thelmaandbonnies.com. 1. Fill a stockpot 1/2- to 3/4-way full with water and a couple tablespoons of salt. Wait until the water is boiling, then add pasta. Cook pasta for eight to 10 minutes or until al dente. Drain, set aside. 2. Cook hamburger along with onions. Drain any grease off. 3. Add cooked ground beef, cream of mushroom soup, tomato soup, tabasco, chili powder, black pepper, and red pepper flakes into an electric skillet or another type of skillet and mix together until simmering. Once simmering, add in cooked spaghetti noodles. 4. Once mixed, turn off skillet and serve with salad and/or fruit. Enjoy! 2. 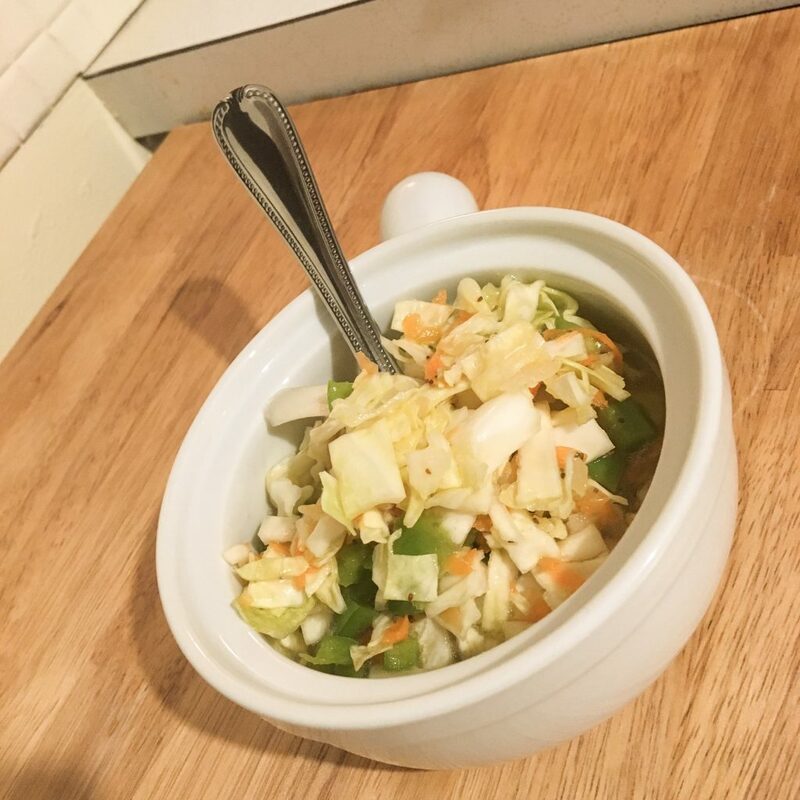 Put cabbage, carrots, onion, and green pepper in a bowl. Sprinkle one tablespoon of sugar on top and mix. Put to the side. 3. Put dressing ingredients in sauce pan and bring to a boil. Once ingredients reach boiling point, IMMEDIATELY pour over cabbage. Mix well and cover. 4. Refrigerate four to six hours. Pour off excess dressing as you eat the coleslaw. (The dressing helps the coleslaw keep.) Lastly, store in the fridge.